Registries - Korea Kennel Federation, United Kennel Club, AKC-FSS, etc. 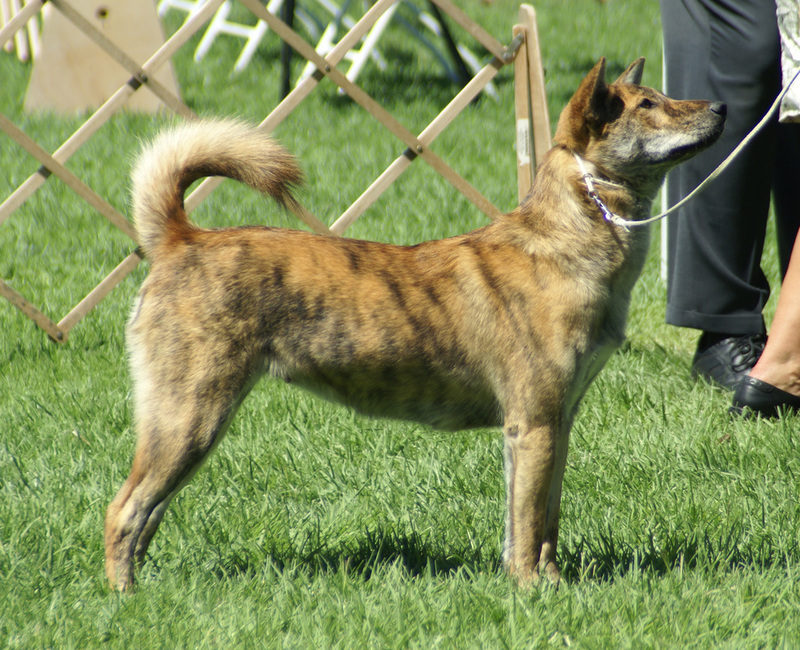 Originally, HoSu was purchased with the expectation that she would just be a KKF-pedigreed, brindled Jindo that would require several generations of breeding to improve to her line to show quality. HoSu has exceeded our expectations by bounds. Despite being imported and picked up at 3 months of age, she is a very confident girl who is fearless of her environment. She is friendly towards normal people but guardy against suspicious people. She hunts AND retrieves vermin on her property. HoSu is a Multi Champion. She is a UKC Grand champion, ARBA champion, KC-USA champion, as well as having several juvenile championships. She has great movement that turn heads at dog classes and dog events. She also has a very typy, feminine head. In between conformation showing, HoSu is being trained for the obedience ring. 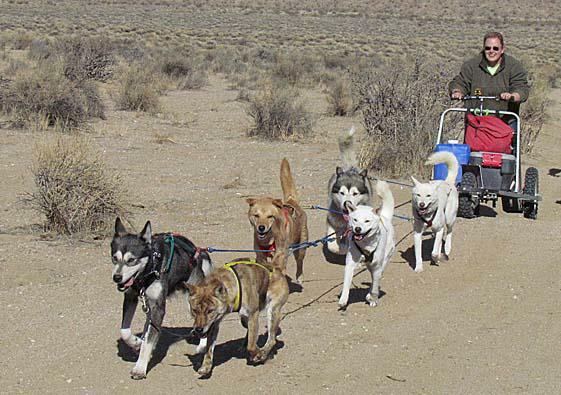 She also plays in several dog sports such as mushing in the high desert during the cooler winter months. She shows a natural aptitude to be a future lead dog. Caught and retrieved first ground squirrel. Exhibited at America's Family Pet Expo in the Korean Jindo booth. Earned American Kennel Club STAR Puppy. Entered first United Kennel Club conformation shows. Entered first American Rare Breed Association/Kennel Club USA/Kennel Club International show. Won Best in Show in ARBA/Kennel Club USA under Mrs. Julianna Bowen. Won 1st Place overall under Judge Park, In Ro. Earned the AKC Canine Good Citizen Certificate. Competed in the ARBA Invitation/KC USA and won 2 ARBA BIS and 3 KC USA BIS. Finished her ARBA Adult Championship. Competed in the International All Breed Canine Association. Earned Reserve Best Rare Breed in Show on 4/14. Exhibited in the America Family Pet Expo in Orange County. UKC show - 2 x Best in MultiBreed Show!! UKC show - Best in MultiBreed Show!! First time entering AKC Coursing Ability tests. AKC Coursing Ability (CA) title earned. Earned AKC Coursing Ability Advanced (CAA) title.